Skywatchers all over the world jumped at the chance to view and photograph Friday's (Aug. 31) full moon, the last so-called "blue moon" until July 2015. Friday's full moon was the second one to rise during the month of August, following the full moon of Aug. 1. This qualifies it as a blue moon, according to the popularly accepted (but incorrect) definition of the term. "Blue moon" orginally referred to the third full moon in a season that has four full moons instead of the usual three. But in 1946, a writer for "Sky and Telescope" magazine erroneously reported the second-full-moon-in-month meaning, and the definition stuck. Maggie Chen took this photo of the blue moon August 31, 2012 at around 8:20 p.m. ET. Friday's blue moon rose on the same day that late astronaut Neil Armstrong was memorialized in Cincinnati. Armstrong, the first person to walk on the moon, died Aug. 25 following complications from a recent heart surgery. "From Michigan, we are thinking of you, Neil," wrote Dennis Daniels, who photographed the full disk of the moon Friday night. "Thinking of you, Neil," wrote Dennis Daniels, who took this blue moon photo to honor the late Neil Armstrong, who died Aug. 25, 2012 a week before this photo was taken. However, some sky photographers, such as Johan Clausen of Denmark, used photographic effects to get pictures of blue-looking moons. This photo of the August 2012 blue moon was taken by Johan Clausen in Denmark. Another stunning photo of the blue moon was taken by photographer Ajay Talwar of "The World At Night," from India. "Yesterday's blue moon was actually reddish when it rose over the Avenue Rajpath, New Delhi," Talwar wrote. "Actually it was lucky to have been visible at all during the Indian Monsoons." "Yesterday's blue moon was actually reddish when it rose over the Avenue Rajpath, New Delhi," wrote photographer Ajay Talwar. "Actually it was lucky to have been visible at all during the Indian Monsoons." Blue moons occur because lunar months and calendar months aren't perfectly synched up. It takes the moon 29.5 days to zip around our planet, during which time we see the satellite go through all of its phases. But Earth's months all have 30 or 31 days (except February), so once in a while two full moons get squeezed into a single month. The moon looked markedly different from various locations around the world because of the different weather and atmospheric affects in each location. An almost red moon was photographed over Evergreen Valley in Olympia, Wash., by Mary P. Bowman. 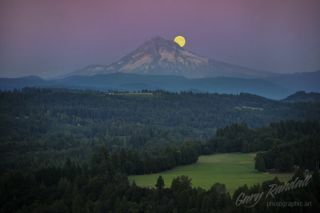 The blue moon over Evergreen Valley in Olympia, Wash., was photographed Aug. 31, 2012 by Mary P. Bowman. Before Friday night, the last blue moon occurred on Dec. 31, 2009. The next blue moon will come along on July 31, 2015. The phrase "once in a blue moon" implies that the celestial phenomenon is incredibly rare, but it's really not. Blue moons occur on average once every 2.7 years, and sometimes much more frequently. In 1999, for example, two of them rose within three months. The next year that will see two blue moons is 2018. If you snapped any good photos of Friday's full moon and would like them to be considered for a future story or gallery, please send them to SPACE.com assistant managing editor Clara Moskowitz at cmoskowitz@space.com.